As we are racing to build the best solutions for the brightest digital world there are casualties along the way. Designers and builders often fail to acknowledge, or manage, the negative impact their digital solutions may be having on people and the planet. Understandably it is painful to realize that the tools you create can cause harm, but suppressing those insights will only hurt more. 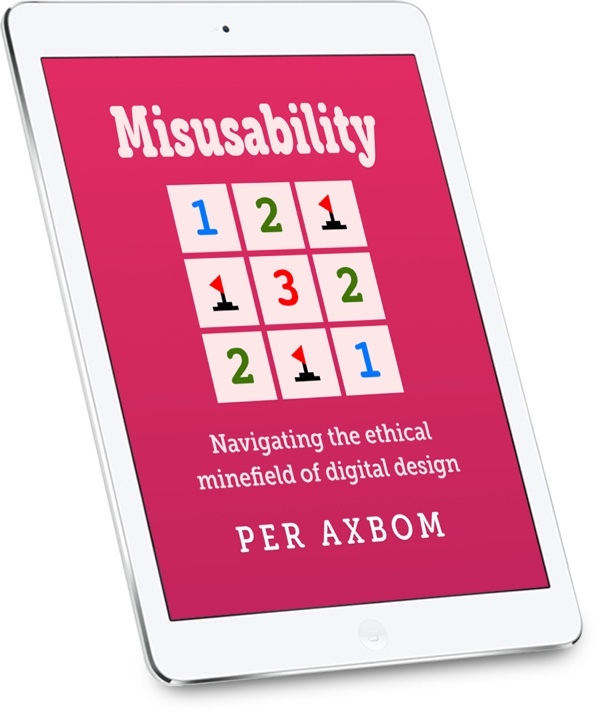 In this book Per Axbom shows what can - and often will - go wrong, and guides you through a process for designing with a conscience. 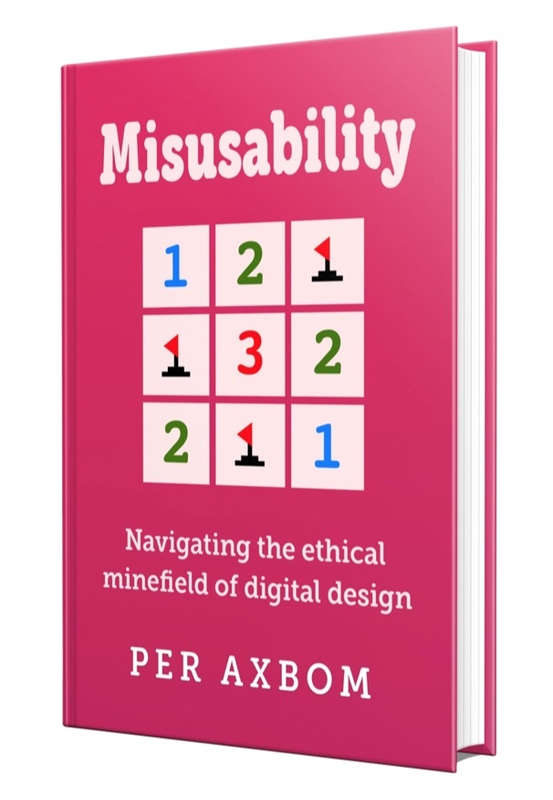 A misuse of usability — what I refer to as misusability — is what happens when we use techniques for removing friction and obstacles in an effort to encourage a specific outcome, and these also lead to significant negative impact. As such misusability can both be a conscious act and an inadvertent effect of good intent. Negative impact may encompass psychological stress, financial loss, enforced inequality or acts that clash with personal goals. Allowing the growth of a culture of racial profiling in an online forum without intervening. Sending notifications intending to increase usage of a service but instead important notifications trigger anxiety and are ignored. Covertly using personal data to provide a "better experience" but at the same time exposing this data to groups with maleficent intent. Streamlining a purchase process in such a way that individuals buy the wrong thing, or more than is in their best interest. Learn how to manage negative impact and "usability misuse"
You'll also be one of the first to know when a release date is set. The newsletter is powered by Buttondown. 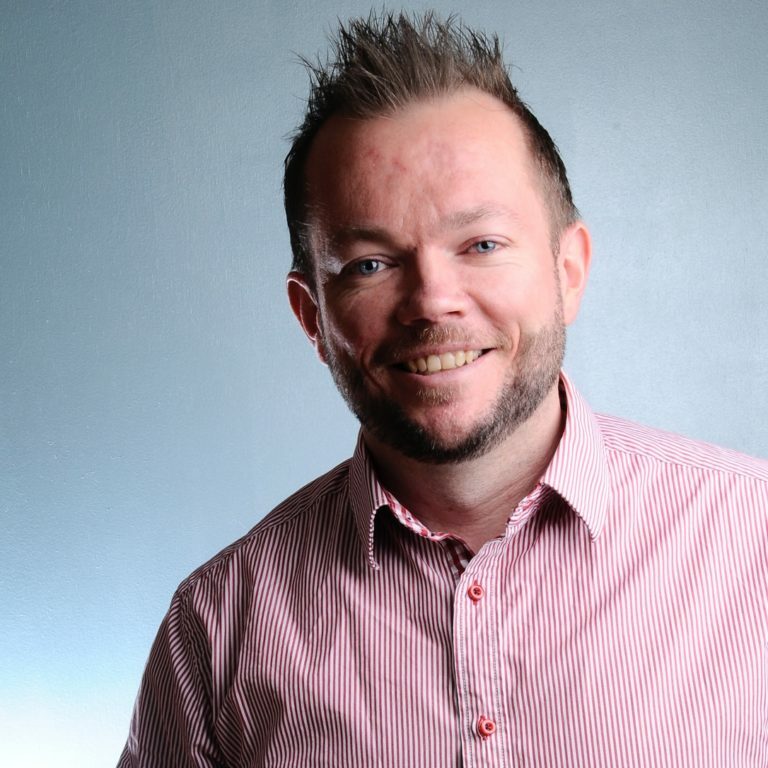 Per Axbom is a designer, coach, visual explainer and podcaster working out of Stockholm, Sweden. He has worked professionally in usability, accessibility and UX for more than 20 years. His passion for interviews, sketches and prototypes allow him to understand vividly and explain comprehensibly. His passion for listening helps people get unstuck and move forward in work and life. Over the years, Per has consulted for over 50 organizations, startups as well as leading international corporations, recently working as UX lead for Sweden’s national platform for online behavioral therapy. As a designer he has oftentimes been troubled by cognitive dissonance, wary of how designing what's right is not always so obvious. Addressing the ethics of design, and challenging generally accepted truths, has now become a calling.